Imagine if you will Tyrannosaurus rex running through the landscape, and how compelling this scene is knowing that evidence now points to birds being the dinosaurs’ closest living relatives. Back in 2004 scientist Mary Schweitzer at North Carolina State University made this exciting discovery when studying the soft tissue of an ancient leg bone of a T.rex. which had been dug up in a site in Montana. Proof of the evidence came when she compared samples of the dinosaur bone with ostrich and emu bones which show near-identical features. 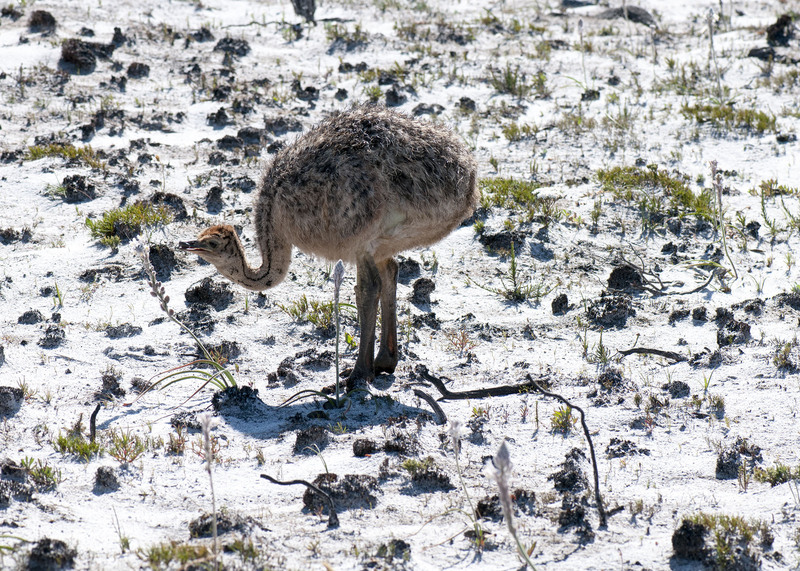 Since then further fossil finds are revealing more information on feathered dinosaurs and evidence to their link to the evolution of modern day birds particularly the ostrich. A good match, a handsome pair of ostrich stroll along the beach in the late afternoon. The results of the perfect pairing, four little chicks. As time rolls on there’s a shift as spring gives over to summer and trending now is the season for cute babies: parenting roles come to the fore. There is much activity in our backyard with the chirps and cheeps from the pair of feisty of wagtails and their chicks. This year they built their nest craftily anchored to a trellis supporting a jasmine creeper. Two rotund chicks have fledged but the parents will continue feeding them until they are self sufficient. Other nesting pairs are sitting (though fortunately not in the backyard) or guarding nest spaces and like a maiden aunt i am anxiously awaiting results. On the left, is the spotted thick-knees which have previously featured here in this blog. By scoping out the nest with binoculars when the parents change sittings I can make out that there are two eggs. 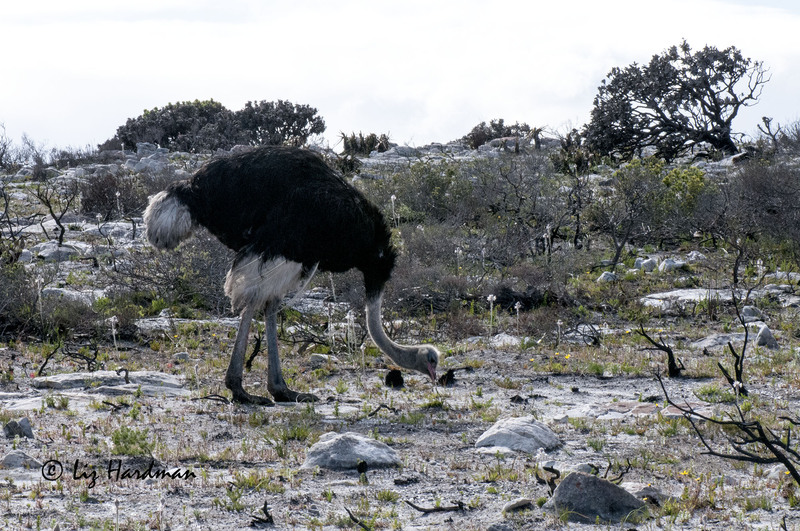 Ostrich in his black night attire is inconguously sitting in broad daylight, which rather debunks the theory that the female with her drab colouring is better camouflaged for duty during the day. They go for big broods and lay between 15 – 20 eggs. The last on the right, is the Kittlitz plover, a shy retiring, little bird. Hopefully, soon I will have more to report on the happy flutter of new arrivals. 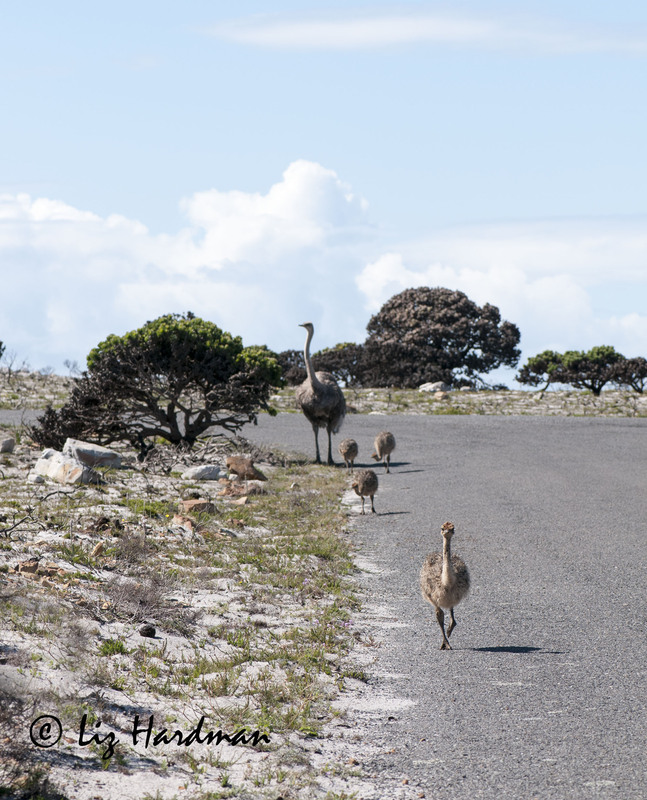 In November while cycling at Cape Point I encountered a large family of ostrich and posted pictures of the cute little chicks. It’s some months later and now the chicks have grown into handsome birds. Notice how their feathers are darkening, a couple more months and they’ll be fully grown. Except for the little “Laat Lammetjie” (a term used generally with affection for a late birth out of season) – a chick which is much smaller than the rest of the flock yet appears to be quite a feisty little character. 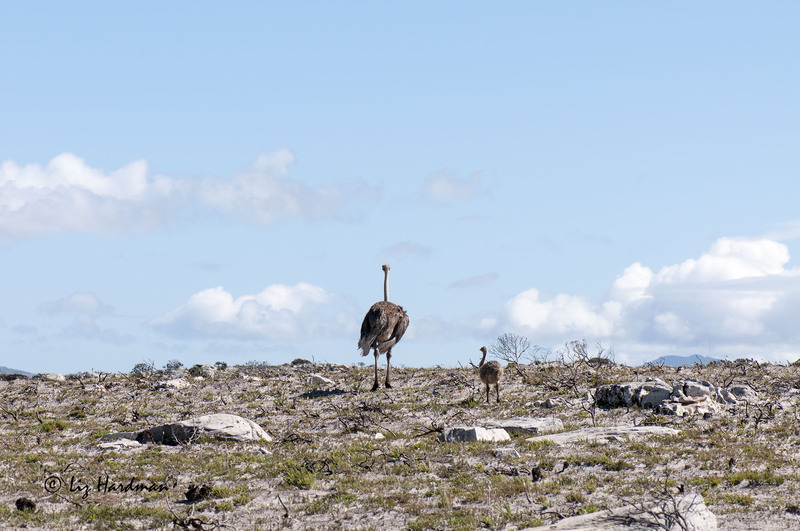 My early morning cycle ride in the Cape Point reserve came to a halt as I came across a large family of ostriches. Pa flapped his wings at me so I backed off to watch at a distance. The adults are protective of their young and there were at least 12 chicks. Pa returned to foraging and I noticed that he was feeding on the showy Trachyandra hirsutiflora, a plant which generally flowers after fire. 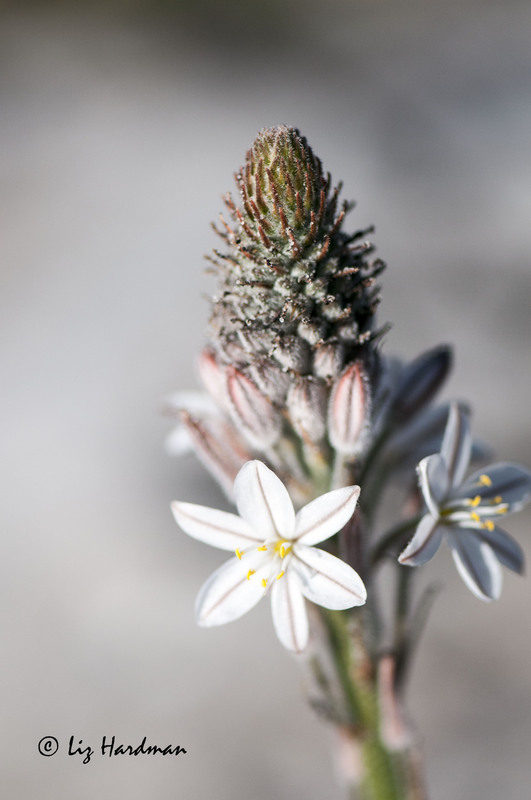 The tall flower spikes bear multiple white flowers on a headlike raceme and the hairy fruits are bunched below. 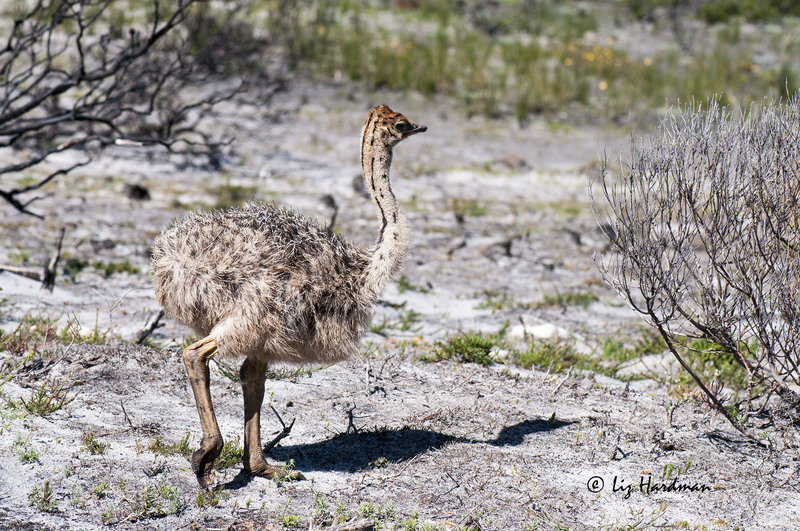 The young are well camouflaged against the sandy background and have the same graceful gait of the adults. A close-up of the flowers, Trachyandra hirsutiflora (Veldkool). The chick is eating one of the fruits from the Trachyandra hirsutiflora. The parting shot shows the comparative size between adult and chick as the last chick follows the female over the rise.